Total knee replacement is a surgical procedure where the worn out surfaces of the knee are resurfaced with metal and plastic components. Over time, cartilage that cushions the bones can wear away, cause pain and discomfort, and make simple activities like walking difficult or even unbearable. A knee replacement can reduce or eliminate pain, allow easier movement and restore independence. 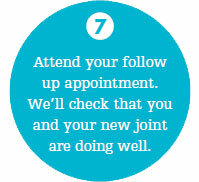 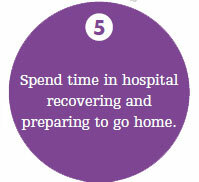 Your knee replacement journey at ROH will follow these steps. Click on a step to find out more.